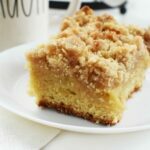 A perfectly moist apple crumb cake that features mayonnaise and organic ingredients to produce the best cake around for the fall season. Preheat oven to 350°. Grease 13 x 9-inch baking pan, set aside. 2. In large bowl, combine dry cake ingredients, set aside. 3. In medium bowl, whisk eggs, Hellmann's, and extract. 4. Toss apples with flour mixture, and stir in mayo mixture. Combine evenly. 5. Add batter to greased baking dish. 6. For Crumb Topping,combine all ingredients with clean hands, and gently squeeze mixture to crumbs. 7. Bake 50-55 minutes or until toothpick inserted in center comes out clean and crumbs are golden. 8. Allow cake to cool before cutting. Enjoy!